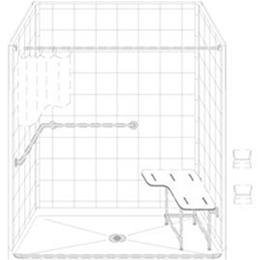 This Commercial Grade Four Piece Smoothwall Shower features center drain and Accessory Package. 3/4" to 2" curb height option. Complies with CSBS/ADA minimum dimensions for 60" x 30" roll-in showers. Sectional unit allows for in-place installation, one component at a time without the need for rear access. Full plywood backing on all walls for outstanding strength and customized accessory placement. White Gelcoat finish (standard). Accessories include: Satin Stainless Steel Grab Bar, Seat, Rubber WaterStopper Kit, Valve Package with Handheld Assembly and Symmons Shower Valve, Curtain and Curtain Rod Kit with Mounting Brackets and No-Caulk Brass Drain with Polished Chrome Screen.